Although it counts less than 4,000 inhabitants, the little village of Argelès-Gazost is very charming. By visiting the village, you will get a true feeling of the Pyrenean culture. At the crossing of big touristic sites in the Pyrenees and the ski resorts, the village of Argelès-Gazost is a key place to visit during your stay in the Pyrenees. Located at 400 meters of altitude, for the lower part of the city, and at 600 meters for the high one, the city is also appreciated for its microclimate. The temperatures are indeed milder in Argelès-Gazost than in the rest of the valley. The city is worldwide known for its thermal baths, and along with the shops and attractions, Argelès-Gazost is a very touristic place in summer and in winter. The casino and the English-style park, the old town, the market and its local specialties are worth being seen. The welcoming and environment-friendly city hosts the colline aux marmottes, or the marmots' hill, which is also known as the “Pyrenees animal park”. 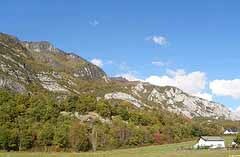 A few kilometres away, a little bit more uphill, you will also find the Donjon des aigles (Eagles' Dungeon). To sum it up, in Argelès-Gazost, you will find attractions that will satisfy everyone! If you want to go to Gavarnie to admire the famous glacial Cirque, or to Cauterets, to have a walk to the Pont d'Espagne, you will have to drive through Argelès-Gazost. It is also a transition zone, in winter and in summer, for the ones going hiking or skiing in one of the ski resorts of the Argelès-Gazost valley. To go to Argelès-Gazost, follow the National road 21 on 12 km.